The Mills River watershed contains a large and popular trail complex, with many trails open for mountain biking. 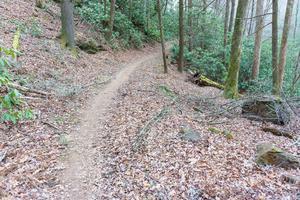 This includes trails in both the North and South Fork Mills River drainages. Get ready, get wet, GO! The area stretches from Bent Creek Gap in the north to the Pink Beds near Davidson River in the south, and is roughly bordered by the Blue Ridge Parkway to the west and NC 280 to the east. 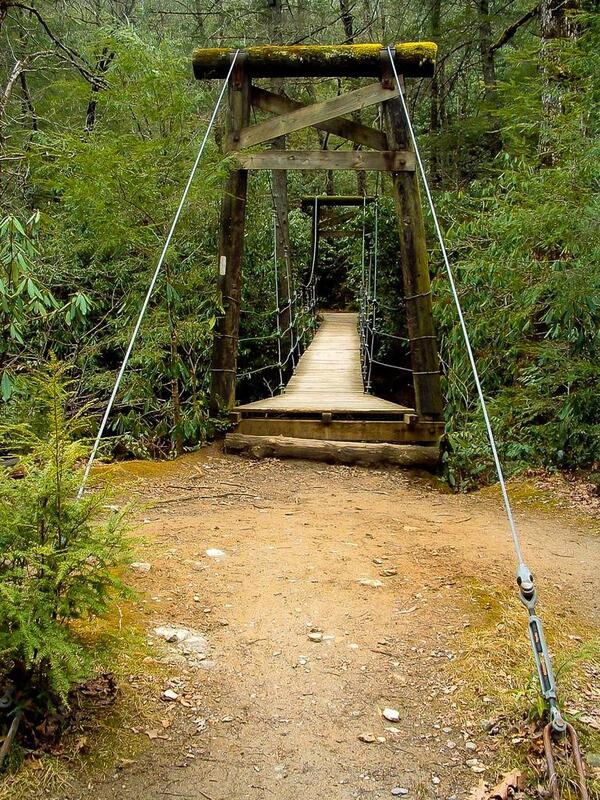 Mills River has the largest collection of trails in any of the National Forest districts in Western North Carolina. Overall, this area has a denser trail network than neighboring South Mills River. 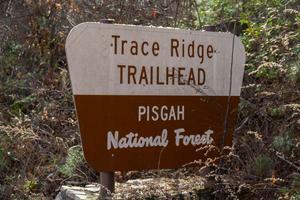 A developed National Forest trailhead parking area called Trace Ridge provides access to a trail of the same name, as well as other Pisgah classics such as Spencer Branch, Fletcher Creek, and Middle Fork. The Wash Creek and Bear Branch trails provide more moderate options nearby. While much of the North Mills River area has been involved in logging and other forms of forest management in recent years which will be quite evident on your ride, the Big Creek trail provides a more backcountry experience as it heads upstream away from the Hendersonville Reservoir. You can relax by the former water supply's dam and its associated waterfall when you're done exploring the area. The excellent Squirrel Gap trail, nearly obscured by leaves on this day in early fall, crosses this slope on a sidehill path. It really starts to feel like backcountry in this part of the South Mills River area. The South Mills River area is a bit less accessible than North Mills River, and for that reason, trails here have a more backcountry feel to them. The trail network is larger, but more spread out than it is in North Mills River. Turkeypen, Laurel Mountain, and South Mills River parking areas are located in the South Mills River drainage. Technically, the Pink Beds picnic area is part of South Mills River as well, but it's usually more closely associated with the Davidson River area since it's right next to US 276. Well-known trails open to mountain biking in the area include South Mills River, Mullinax, Squirrel Gap, and Turkey Pen Gap. 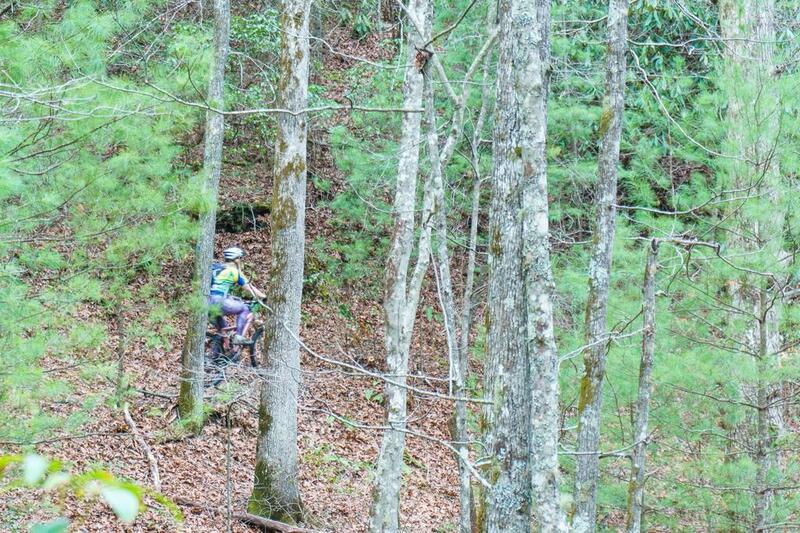 Squirrel Gap is frequently rated as a favorite for mountain bikers due to its backcountry setting, narrow tread, singletrack construction, and connections with other trails in the area. This view of Pink Beds opens up from an outcrop above Pilot rock, just off the trail by the same name. 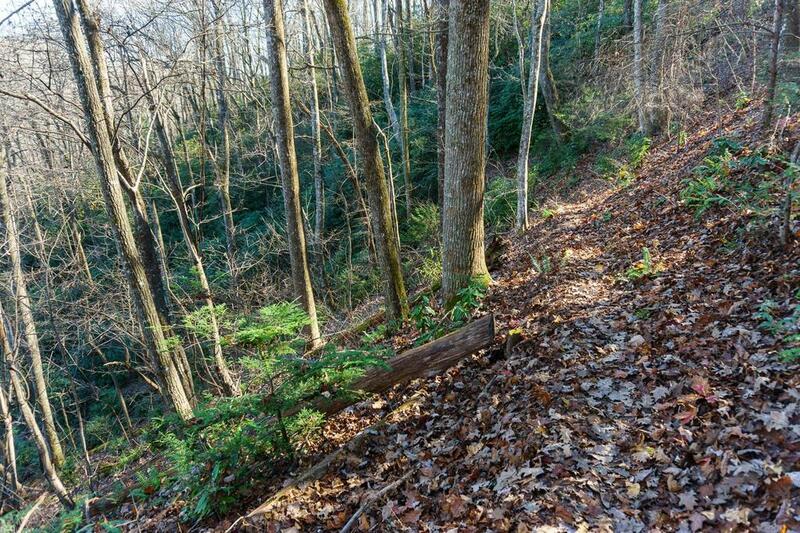 In the higher elevations, there is another cluster of trails centered around Forked Ridge: riders can use the Laurel Mountain, Pilot Rock, and Pilot Cove/Slate Rock trails. Great loops can be made from these trails and connecting gravel roads. 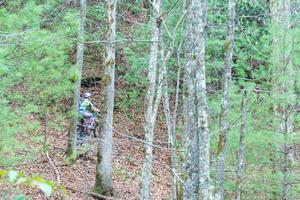 Two loops in the Mills River area - Fletcher Creek and Laurel Mountain - are Best Rides on this site. 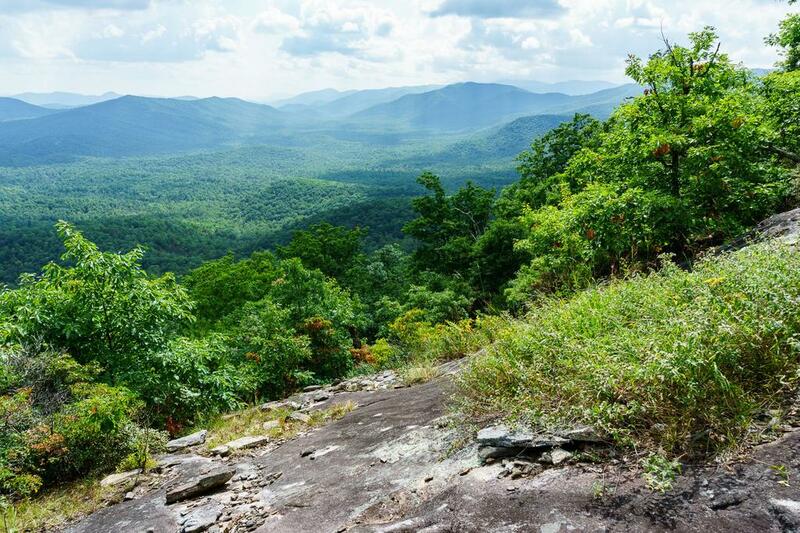 Since the area is relatively undeveloped, there arent as much in the way of visitor facilities as there are in nearby sections of the National Forest. 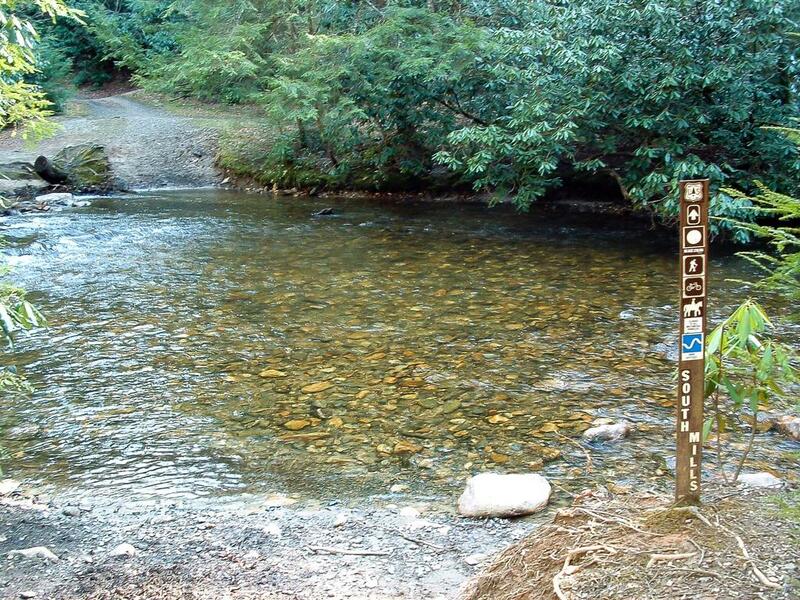 The North Mills River recreation area is located five miles west of NC 280 on North Mills River Road, at the entrance to the National Forest. It has a small campground, picnic area with drinking water, and restrooms in season. 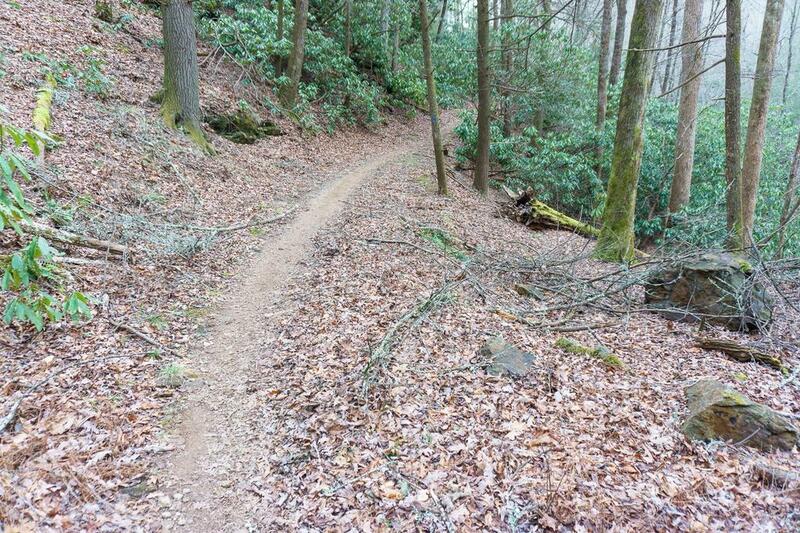 Mountain bikers using the area can connect to the trails via Yellow Gap Road (FS 1206) or Wash Creek Road (FS 5000); however, it is not necessarily the most convenient place to park if you're just visiting for a ride. A fee is charged for parking as well. 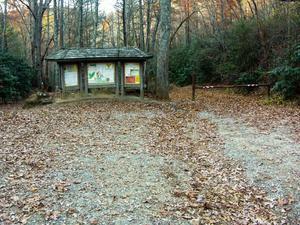 The Trace Ridge trailhead includes a large parking area and signage. It connects you to the Trace Ridge, Fletcher Creek, and Wash Creek trails most directly. No drinking water or toilet facilities are provided. The Turkeypen trailhead includes a large parking area and signage. It connects you to the Vineyard Gap, Turkey Pen Gap, South Mills River, and Bradley Creek trails directly. Like Trace Ridge, no drinking water or toilet facilities are provided. The Pink Beds picnic area, technically within the South Mills River drainage yet more associated with the Davidson River area since it's beside US 276, has restrooms and water in the warm season. 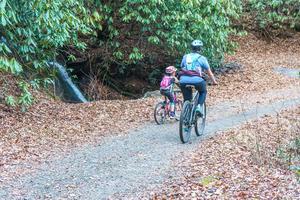 Trails connect through the Pink Beds to the South Mills River area, and riders can use Yellow Gap Road to reach the Laurel & Pilot Mountain area trails. Now open year-round (with limited services from November 1 - March 31), this campground, located adjacent to the picnic area at North Mills River Recreation Area, offers 16 level, shady sites with flush toilets. Smaller RV's will fit into some sites and are welcome, but no water or electricity hookups are provided. The campground is across the road from the river and a picnic area and large grassy meadow are nearby. 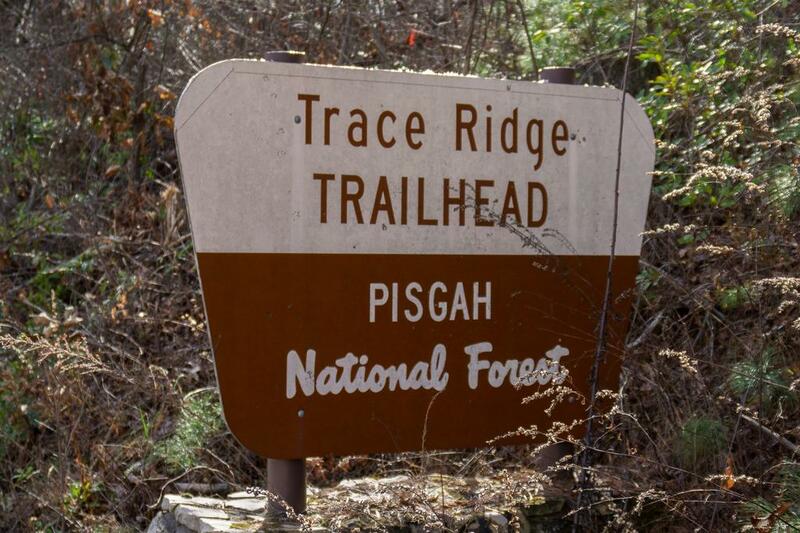 The campground is within a short distance of trails that start at Trace Ridge trailhead, and within a few minutes' drive of all trails in the Pisgah ranger district. You can get more information and reserve a site on the North Mills River Campground page on Recreation.gov. Several free designated roadside campsites are dispersed along FS 5000 and FS 1206 in the Mills River area. (Camping is not allowed along gravel roads except at these designated sites). These graded sites have gravel tent pads and lantern posts, as well as some other fixtures such as fire rings and picnic tables installed. Some of them are very nicely situated along streams or other scenic locations. This makes these sites very desirable for those looking to save a buck on campsites, but they are for tents only on a first-come, first-served basis, and are usually completely full on summer weekends. If you would like to see your place of lodging listed here, please contact us. From Asheville, take I-240 west to I-26 east. Take Asheville Airport exit (exit 40) and go south (right) on NC 280 for 3.9 miles. Just past intersection with NC 191, make a right at the stoplight onto North Mills River Road and follow signs to the North Mills River Recreation area in 5.0 miles. The recreation area parking is on the left; the campground is on the right. Just past North Mills River Recreation Area parking lot, make a right onto Wash Creek Road, which is now paved for the first 1/4 mile or so. Follow this for several miles; this is FS 479 although a sign at the beginning used to say "1000". Turn left onto the first un-gated gravel road which has a concrete low-water bridge, and follow this 0.5 mile to the Trace Ridge trailhead and parking lot. Continue past the turnoff for North Mills River Road on NC 280. Turn right on Turkeypen Road after 7.1 miles (11.1 miles from Exit 40 on I-26). This is a narrow gravel road about a mile long; a large parking area is available at the end where several trails begin.